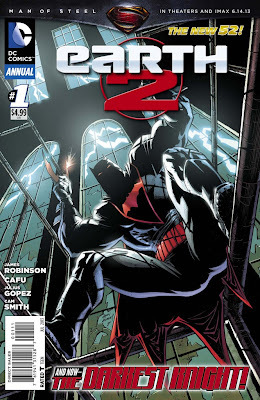 Fruitless Pursuits: DC Comics New 52 - Stryder's Weekly Top 5...er...3!! 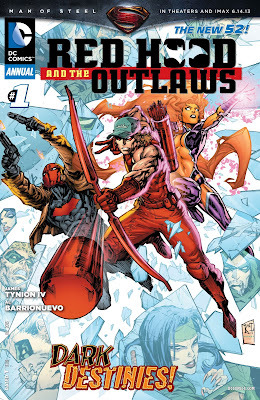 Red Hood and the Outlaws Annual #1 - "For the last time...GET YOUR WEIRD ROBOTS OFF ME, ROY!" We've been waiting for a long time and finally in the Outlaws' first annual, Arsenal confronts Green Arrow! About half the issue consists of flashbacks into Roy and Oliver's shared past, shedding light on both of our arrow-wielding crime-fighters! We learn a lot about their relationship and subsequent falling out in the New 52! It's about time! Incidentally, Green Arrow comes to the Outlaw's secret island hide-out to try and warn them of a HUGE price on their heads, but instead ends up leading an assassin right to them. Classic Ollie... This isn't just any assassin, either...our heroes must face off against highly-skilled and enigmatic meta-human Cheshire! Meanwhile, Red Hood still has amnesia due to his memories being removed by the all-caste last issue, and is thus little help with either Cheshire or Green Arrow. Not great news for our three misfit heroes, but good for us! Very entertaining! 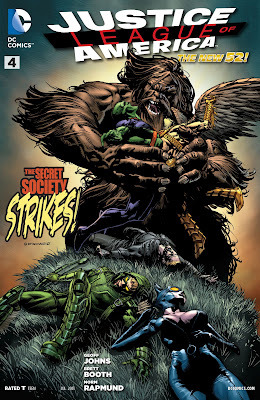 Justice League of America #4 - "You know what they say about the cat. Curiosity and all that." We also get a cool back-up story about Martian Manhunter that explains why he is vulnerable to fire! It's great to learn more about this enigmatic character, as he's a real mystery in the New 52 and deserves deeper characterization. Good issue! Like any good Canadian, I continue to talk about Hockey this week at Stryder's Dementia! This time I explain my interest in the game! Take a look, ya hoser! Ok that's it! June is here and it's a lovely day...go outside!! Peace! !